Neil MacGregor tells the story of a 7,000-year-old Japanese clay pot which has managed to remain almost perfectly intact. The Director of the British Museum, Neil MacGregor, retells the history of human development from the first stone axe to the credit card, using 100 selected objects from the Museum. Neil tells the story of a 7,000-year-old Japanese clay pot which has managed to remain almost perfectly intact. Pots began in Japan around 17,000 years ago and by the time this pot was made had achieved a remarkable sophistication. Neil explores the history of this cooking pot and the Jomon, the hunter-gatherer society that made it. Archaeologists Professor Takeshi Doi and Simon Kaner describe the significance of agriculture to the Jomon and the way in which they made their pots and used decorations from the natural world around them. This particular pot is remarkable in that it was lined with gold leaf in perhaps the 18th century and used in that quintessentially Japanese ritual, the tea ceremony. 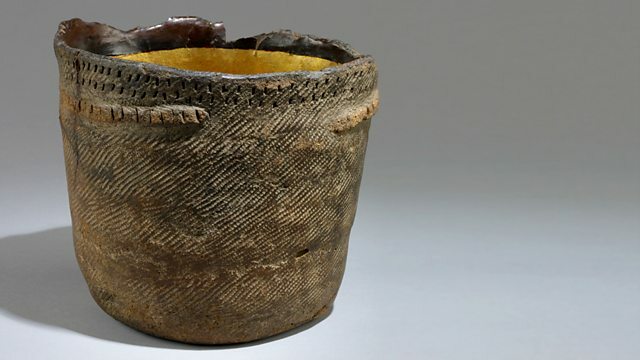 This simple clay object makes a fascinating connection between the Japan of today and the emerging world of people in Japan at the end of the Ice Age. Jomon pots are the oldest pots in the world. Pottery was invented by people living in Japan, China and Korea during the last Ice Age about 14,000 years ago. Pots allowed people to boil foods such as nuts and shellfish to make them edible. This complete pot was found thousands of years after it was made and put to a new use. During the 1800s the inside was lined with gold foil and lacquered for use in Japanese tea ceremonies. How did hunter gatherers make pots? It was once thought that the first pots were invented by farmers. The nomadic lifestyle of hunter-gatherers meant that they were unable to carry pots. The Jomon were hunter-gatherers however, and were able to develop pottery because of Japan's unique environment. They lived in a particularly food rich area - their diet contained over 65 different mammal species. This allowed the Jomon to settle in one place for several years and encouraged the development of pottery for cooking food. Jomon means cord-pattern and the Jomon people are named after the rope-like design on their pottery. What was cooked in ancient pots? Pots with preserved original contents are very rare. We cannot fully reconstruct ancient recipes by analysing food residue but we can recognise types of food that were cooked. This helps us to understand the range of foodstuffs that were available in the ancient diet and how the cooking of these foods may have improved their nutritional value or preserved them. So, we can start to understand more about how food resources were managed in the past. Burnt food deposits are sometimes found on the surfaces of cooking pots and these can be analysed to detect the foods that were cooked. Even seemingly ‘clean’ vessels often contain the remains of foods which have been soaked-up by the fabric of a vessel. These ‘invisible’ residues are usually better preserved than surface deposits because the ceramic fabric protects them from decay. Residues are analysed by using a technique known as gas chromatography – mass spectrometry (GC/MS). This separates the molecules of the residue and provides information from which these molecules can be identified. It is a powerful method for understanding what is present in ancient food residues. Some food stuffs preserve better than others. Fats are insoluble in water and fairly resistant to decay, whereas sugars and proteins are much more likely to be lost over time. For this reason fatty foods – such as meat, fish, dairy products and vegetable oils – are the most commonly detected.